Technofrolic : Information Technology: Tweak Windows7 - Reduce hangup time on welcome screen. Tweak Windows7 - Reduce hangup time on welcome screen. Many of the Windows 7 users complain that their system hangup on welcome screen for long time. 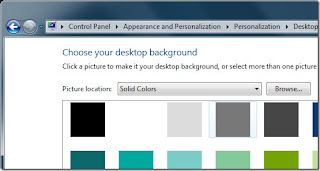 If you set a solid color background instead of a picture or a wallpaper, your system will hang for 30 seconds during the logon process. It is a limited yet huge problem. Instead of fixing this problem manually, Microsoft has provided a small to application to get rid of this glitch. The application is called HOTFIX. You will see the x86 version of Hotfix if you are using Internet Explorer(32-bit) or any other browser. To download the 64-bit(x64) version of Hotfix you will have to visit the above link using Internet Explorer(64-bit). You can download it from the link below. Tweak Windows 7 : Change logon Screen. DIGITAL JANITOR: Sorter for downloaded files.